How Do You Get an Elderly Person to Eat? If your senior loved one fails to eat, he or she could develop deficiencies in important vitamins and minerals. Getting seniors to eat can be challenging if they’re sick or have cognitive deficits. Here are some ways to get seniors to eat so they can meet their nutritional needs. Many elderly people are lonely and don’t like dining alone. If possible, share a meal with your loved one so he or she has something to look forward to at mealtime. Also, plan an occasional social outing to a restaurant so your loved one can enjoy eating with others. Social isolation and depression can dampen the appetite. However, when your loved one knows he or she will have companionship during meals, the appetite may increase. 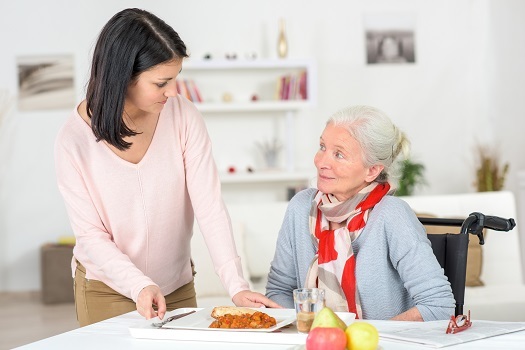 A trained caregiver can provide companionship and additional support to encourage your loved one to eat. Not every senior has the same care needs, which means they don’t all need the same type of senior care. Fair Oaks families can rely on Home Care Assistance to provide individualized care plans to meet your elderly loved one’s unique care needs. Our holistic Balanced Care Method was designed to help seniors focus on healthy lifestyle habits such as eating nutritious foods, exercising regularly, and maintaining strong social ties, and our Cognitive Therapeutics Method offers mentally stimulating activities that can stave off cognitive decline and delay the onset of dementia. Many elderly people fail to understand how important nutrition is for their overall health. If you explain the benefits of eating well to your loved one, he or she may be more inclined to eat. Inform your loved one that certain foods act like medicines to keep him or her healthy and strong. For example, foods rich in omega-3 fatty acids, such as salmon and nuts, can promote cardiovascular health by reducing blood pressure and cholesterol. In some cases, eating healthy may reduce the need for certain prescription medications, which is an enticing benefit of eating well. Helping an aging adult get proper nutrition when he or she doesn’t want to eat can be exhausting, so it’s important for caregivers to make time to attend to their own wellbeing. Families who find it difficult to care for their aging loved ones without assistance can benefit greatly from professional respite care. Fair Oaks, CA, family caregivers who need a break from their caregiving duties can turn to Home Care Assistance. Using our proprietary Balanced Care Method, our respite caregivers can encourage your loved one to eat well, exercise regularly, get plenty of mental and social stimulation, and focus on other lifestyle factors that promote longevity. If your loved one needs help eating during mealtime, avoid rushing the process. If food is gulped or not chewed properly, your loved one may lose his or her appetite. Also, if you appear rushed when feeding your loved one, he or she may feel like a bother and refuse food. Showing your loved one you enjoy helping during mealtimes reduces stress and makes eating more enjoyable. Many seniors feel depressed over their loss of independence and inability to prepare meals. To help your loved one feel more hopeful and confident, involve him or her in meal preparation. Allow your loved one to plan meals, choose ingredients, and season the food to his or her individual taste to make mealtime exciting again and provide a sense of pride. If your loved one is ill or in pain, he or she may not have an appetite. Make sure your loved one has taken all prescribed medications so his or her appetite may be heartier when it’s time for meals. While it’s important that seniors take all their prescribed medications, monitor the side effects. Certain medications can cause gastrointestinal disturbances and loss of appetite. If your loved one has a poor appetite after taking medications, his or her doctor can lower the dosage or discontinue the medication altogether. Professional caregivers with training in nutrition and healthy habits can be a wonderful source of information and encouragement for seniors who have lost interest in eating. Maintaining a high quality of life can be challenging for some seniors, but professional caregivers can help them obtain this goal. Families can trust Fair Oaks senior home care experts to help their elderly loved ones focus on lifestyle choices that increase the chances of living a longer and healthier life. If you need professional care for your senior loved one, Home Care Assistance is just a phone call away. Reach out to one of our Care Managers today at (916) 485-4663. Is Pilates a Good Form of Exercise for Older Adults?